2016 Sage Hit Low Series Football continues the annual tradition of pre-draft, autograph-heavy football sets. 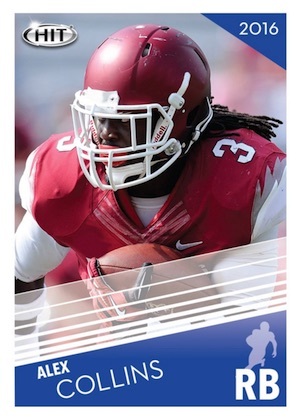 While the cards do not feature official logos or team names, Sage offers one of the earliest chances for collectors to track down the top names eligible for the 2016 NFL Draft. Each hobby box includes twelve autographs. 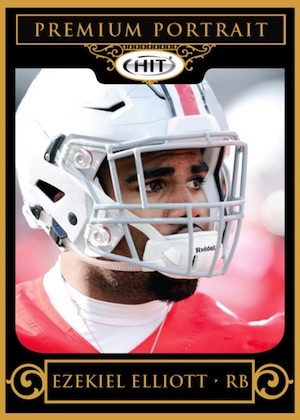 Anchored by a 75-card base set, key subjects include projected early-round picks Ezekiel Elliott (RB - Ohio State), Pharoh Cooper (WR - South Carolina) and Will Fuller (WR - Notre Dame). 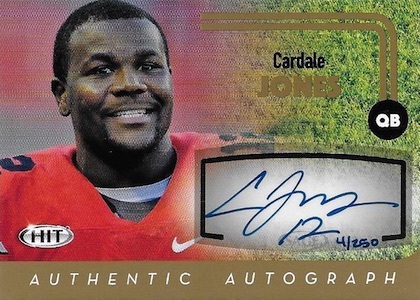 However, collectors are mainly interested in the autographed cards which are all live in the product with no redemptions. 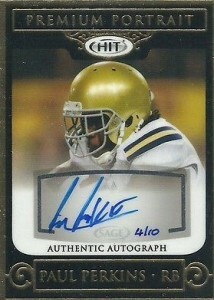 Among the most popular options are Gold Level Autographs that are numbered out of 250. Adding to the base set are a handful of inserts. This includes Artistry, Write Stuff (1:8 packs), and the new foil-stamped Premium Players (1:3 packs). All three inserts also have signed versions that are numbered to 100 or less. Artistry Autographs are the most common, numbered to 100, while Write Stuff Autographs are limited to 25 and Premium Players Autographs check in at just ten copies. 2016 Sage Hit Low Series Football only features autographs that are live in packs and there are no redemptions to be found. 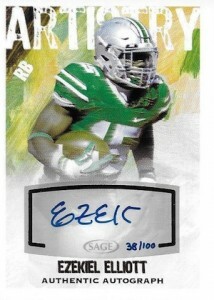 Enhancing the Low Series release, 2016 Sage Hit High Series Football offers an updated batch of base (75 cards), inserts and autographs. Signers for High Series include Alex Collins (RB - Akansas), Brandon Doughty (QB - WKU), Corey Coleman (WR - Baylor), Dak Prescott (QB - Mississippi State), Jared Goff (QB - Cal), Josh Doctson (WR - TCU), and Paxton Lynch (QB - Memphis). I bought a 2016 56-card pack, and got all college cards. Plus, the pictures aren’t even good. What’s so great about a premium portrait? Do not buy this product no matter what! The 2 packs I bought had 2 different Ezekiel Elliott cards, Will Fuller, and Pharoh Cooper, among other top draft prospects. If you can’t be happy with the series then your just grumpy, simple as that. My son bought this pack and got 2 premium portrait cards. Low number autograph of ??? And a Goff. Great pack! Upon closer inspection he points out to me that will fuller premium portrait (pp 13) has him listed as playing for Ohio state and shows E. Elliot’s stats. Elliot premium portrait (pp 12) was the other pp card he had and sure enough the season stats match on the will fuller card. Has anyone else picked up on this? Known error? Rare? 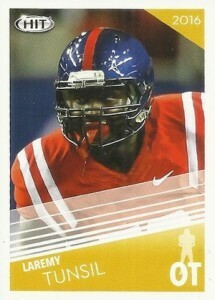 The whole “HIT” brand are the cheapest looking/ plain cards that I have seen since the early 90’s Pacific ones. I mean they are so bad that I wouldn’t even pin them to my bicycle spokes with a clothes-pin if I were a kid again! Also 50% roughly that came in the Walmart Blaster Box have lines going down them (indention) where some production line machinery was set with the tension too tight and pressed down onto the cards too much leaving a slight but easily visible with the naked eye lines going down the long (vertical) length of the card. Some cards have just one of these lines but many have two. Then in that blaster box (only 4 cards per pack in those) they have 2 autographs but then I ended up with around 10 cards that were doubles in the box (two of the same EXACT cards) and 3 or 4 had multiples of three of each of the same exact card! Then regarding card #110 Jared Goff: On the back of the card underneath the college stats they have a rectangular box with a few sentences about the player usually to point out his major accomplishments. Well on the back of mine it has Josh Doctsons write-up and not Goffs as the rest of the card is! Now I seen in another review here that someone else got a card from one guy with different players stats… he was wondering if this is a rare card or just a error that everyone got which would take away from the cards already very minute value. Nobody answered him. I now have the same question plus more questions. Please, if anyone knows or could lead me to somewhere where someone would know: Is my card an abnormality limited to just a few cards and thus valuable? 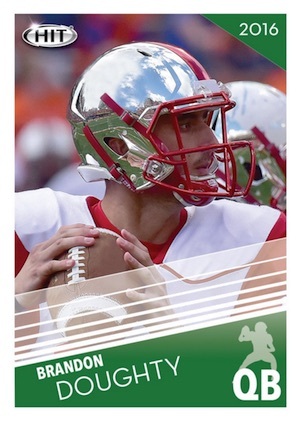 ….or did every single #110 card printed just get left this way with a mistake that nobody caught? I seen that the card stock was very cheap (and by “cheap” I don’t mean “inexpensive”. I also then read on here from someone else who had errors on his card. I seen that their workers didn’t seem to care at all either about the lack of quality in their work which was apparent by all of the ruined cards that have lines going through them. Then I discovered my own card with errors. I then remembered how before I started cracking packs that I noticed on the individual foil wrapper that they list their customer service telephone number and then a warning about how submitting a false claim is against the law. When I read and seen that I thought to myself “that’s odd… I never seen anything like THAT before on the card box or foils! Especially in a size wording that is big enough to be easily read”! ….and now I am suspecting WHY this is and I am REALLY hoping that I am wrong in thinking that whomever did this felt that it was easier to post the customer service phone number and warning than to actually make sure that the staff in charge of proof reading each card is doing the job that they were paid to do… and also easier to print the number and warning than being sure that the factory that prints and packs each card are not ruining the product before it makes it off the factory floor! Where exactly is this factory I have to wonder? Is this whole set from start to finish done by child laborers in communist China? I’d put a “LOL” there but I’m honestly not laughing. This isn’t important in the view of life itself but irregardless it was $20 and being disabled without hardly anything coming in $20 is a lot… 3/4 of my water bill or a weeks food bill… so I have to save up to get extra for my hobby… so when I did that and found out that I was taken advantage of by this company I was/am a little more than wondering what the heck is going on here!? I am so sick of seeing so many companies ran by people who have no idea what they are doing. All of this garbage where people are passed thru school not because they earned it rather so nobody is offended or when the same bunch of people are given jobs and promotions due to things other than personal merit (ability to do the task at hand with professional and/or top results) is all showing it’s ugly head now! We are reaping what we were forced to sow by the scum politicians who pushed that agenda ….and it is just plain wrong. Time to say “enough is enough”! Anyway, I had best stop there… so please if anyone can help with those questions I’d appreciate it. Thanks! Reminds me of the original Pro Set Issue. Lots of Errors. Some became really valuable over time. Millions produced and totally worthless otherwise.